We realize that this change may create some concerns about the intentions of a legacy publisher acquiring an open-access working paper repository. I shared this concern. But after much discussion about this matter and others in determining if Mendeley and Elsevier would be a good home for SSRN, I am convinced that they would be good stewards of our mission. And our copyright policies are not in conflict — our policy has always been to host only papers that do not infringe on copyrights. I expect we will have some conflicts as we align our interests, but I believe those will be surmountable. The last bit is a little ominous but not surprising. I expect lots of people will be upset about this. SSRN has been a gem for researchers. Virtually all of my papers are on it and I link to them from my website. So I fear changes that will make it harder for me. Then again, I know it isn’t perfect. It stands aside from the rest of knowledge and does not link well to citations and other things that are in traditional scholarly publications. In other words, it connects well with the web but poorly with the platforms that have arisen in the space. As those platforms have their own immutable agendas, it is hardly surprising that SSRN might move closer to them rather than towards more openness. As I said, it isn’t a charity. This has happened before to open access platforms. We lost Bepress a few years ago and that move came with all the changes we hate. SSRN and Elsevier have handled this better by promising to keep things the same for a time. And before we panic, it appears that Elsevier has handled similar acquisitions — notably Mendeley — well. As my Twitter feed this morning blows up with concern (#sciencewantstobeshared), sadness and anger, I have some similar feelings. But in the end, the economist in me knows that someone has to pay for all this. There is a tendency to think that user-friendly platforms can come for free. But most academics I know can’t maintain a webpage and I am grateful for the work SSRN has done in making it easier to find things. It is invaluable. However, if we are not shelling out the dollars ourselves, we have to expect that some form of capitalistic incentive is going to play a role. 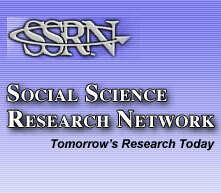 That’s what SSRN has always been and this only reaffirms that path. Is there a bias to user reviews/ratings? This site was created as part of the Sloan Foundation’s Research Project on the Economics of Knowledge Contribution and Distribution.